The Home Improvement Agency helps people who live in the Borough of Scarborough and Ryedale District to maintain their independence in their chosen home. Choices4Energy is now part of the Home Improvement Agency. Community First Yorkshire are rolling out a range of services aimed at raising awareness of the issues faced by older and ex-members of the armed forces and enabling them to lead fuller lives. Find out more about ex-forces support. Disabled facilities grants help disabled and elderly people to live more comfortably and independently in their own homes. North Yorkshire County Council will visit your home to assess your needs. Depending on the outcome, a referral may be made to the Home Improvement Agency and we will then assess the work, obtain quotations, approve grant applications and oversee the adaptation process. Means-tested grants of up to £30,000 are available to home owners and tenants to enable the recommended adaptations to take place. If you fail to qualify, we can still support you through the adaptation process. Alternatively if you would prefer to speak directly to someone please call the Agency on 01723 232323 and ask to speak to a wellbeing officer. 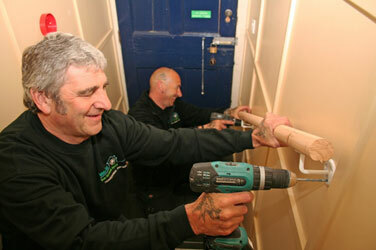 This service helps older, disabled and vulnerable people with small jobs and minor adaptations around the home. For small repairs work a charge of £15 per hour (inc VAT) is made, plus the cost of any materials purchased by the handyperson on your behalf. Please note that the majority of minor adaptations will be provided and installed free of charge. We also run a gardening list in conjunction with local gardeners. If you are looking for help with your garden, please visit our gardening services page.